Save your knees and bathe baby in comfort! 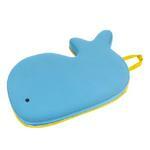 This friendly whales simple design, covered in quick-dry wetsuit fabric, will brighten up baby’s bath. Non-slip backing and cushiony padding give parents achy knees a rest while baby enjoys tubtime!